All orders received before 3pm ET will be dispatched the same day (Monday – Friday, excluding public holidays). Please note: we can only ship to PO box addresses using our USPS and UPS SurePost services. Orders received after 3:00pm ET or on weekends and bank holidays will be dispatched the next working day. We will keep you informed every step of the way: you will receive a confirmation email when we receive your order followed by another one detailing the method of delivery and, if relevant, a tracking number once the order has been dispatched. We send you one more email one month after you ordered just to make sure you're happy with everything. All our inventory is stored in our fulfilment center in New Jersey. We offer great shipping prices and times, including a guaranteed next business day expedited service across continental USA..
Working/business days are defined by our couriers as Monday to Friday, excluding public holidays (sorry - we know many of you work on the weekend but our couriers do not). Most orders to the contiguous United States over $100 will be eligible for free standard shipping. 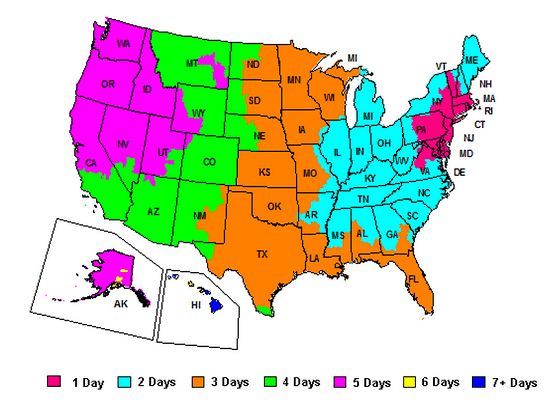 The free shipping service will either be sent on a 1-6 day (see map below) FedEx Ground service or FedEx SmartPost, depending on the size and weight of the order. The faster services we offer aren't included in the free shipping offer. This offer also excludes large or heavy orders. Please note; this is not a guaranteed service and the delivery times are estimates. The price of this service depends on the size and weight of the order as well as the delivery address. The cost will be calculated at the checkout once you enter your zip code. This service is only available for small orders weighing under 1lb. This service takes 1-5 business days to be delivered. If your order is urgent, or you require it by a certain date, please use one of our guaranteed Expedited Services. Please note; this is not a guaranteed service and the delivery times are estimates. The price of this service depends on the size and weight of the order as well as the delivery address. The cost will be calculated at the checkout once you enter your state. 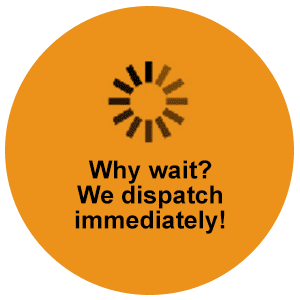 The expected delivery times of this service is 1 - 6 working days from the date of dispatch but these are not guaranteed times. How long your order takes to reach you depends on where it's being delivered. Please see the map below. This service is similar to FedEx Ground. The difference is the "final mile" is delivered by USPS and expected delivery times are 1-2 extra business days compared to the map above. This service is for fairly small parcels weighing 1-9 lbs. Deliveries are expected to arrive within 1-4 business days. Please see the map below for an estimate of delivery times in your area. Orders placed on the FedEx 2 Business Day Air delivery service will be dispatched by courier and are guaranteed to be delivered to all 50 states within 2 business days of the date of dispatch. These deliveries will require a signature. The cost of this service will be calculated at the checkout and depends on the size and weight of the order as well as delivery address. Business days are defined by our couriers as Monday to Friday, excluding public holidays (sorry - we know many of you work on the weekend but our couriers do not). In the unlikely event of your order not being delivered on time, we will refund your postage cost in full. This service guarantees delivery by 7pm on the next business day after the date of dispatch. This service is only available for deliveries to the contiguous US. These deliveries will require a signature. Orders are scheduled to be delivered 2-5 business days from the date of dispatch. This service is fully tracked and will require a signature upon delivery. Orders are scheduled to be delivered 1-3 business days from the date of dispatch. This service is fully tracked and will require a signature upon delivery.